Explore some novel ways to save money and find balance in a demanding consumerist society. First, you better stop eating meat and start smoking. Sell the car you took on finance and get a bus pass. Stop blaming others for your lack of… Oh. Sorry, that’s the ‘How to Live your Life‘ post which will never be in development. What is a Yellow Life? is something I am yet to be asked. And, when nobody asks, I don’t tell them it’s about living life peacefully and joyfully and numerous other things. My Yellow Life could mean anything. But partly it’s about not wasting things. Things like money. Money comes and goes at varies stages of life and as the potato based currency is yet to take hold in any meaningful way, we are left with cash (or promises of electronic transactions) to buy our daily goods. Thriftiness and parsimony are sometimes required when it comes to buying food and beverages in order to have money for life’s essentials. If essentials were iPhones and new shoes. In this vein, I have taken it upon myself to share some tricks to living life on a budget and avoiding needless wasting of money, resources and sanity. Below is a useful Sunday to Monday guide on ways to slim your spending which can be easily screen-shotted and kept/read and disregarded. Toilet roll is an essential item in life and, as such, one will be familiar with making this purchase. Options are abundant these days: single, double or triple sheet; cushion or ultra soft; 9 or 24 pack; help yourself from a public toilet. There are many ways to acquire toilet roll. My advice is not to buy the cheapest available as this can never end well. You’ll use more every time you sit down, it may well cause pain in the long run and you’ll inevitably need to replenish the stock fairly quickly. When living Yellow this Sunday, I suggest buying the biggest pack available of a midrange quality toilet paper (ie triple quilted but not luxury). When I say the biggest, the biggest is what I advise. Above is evidence of this. 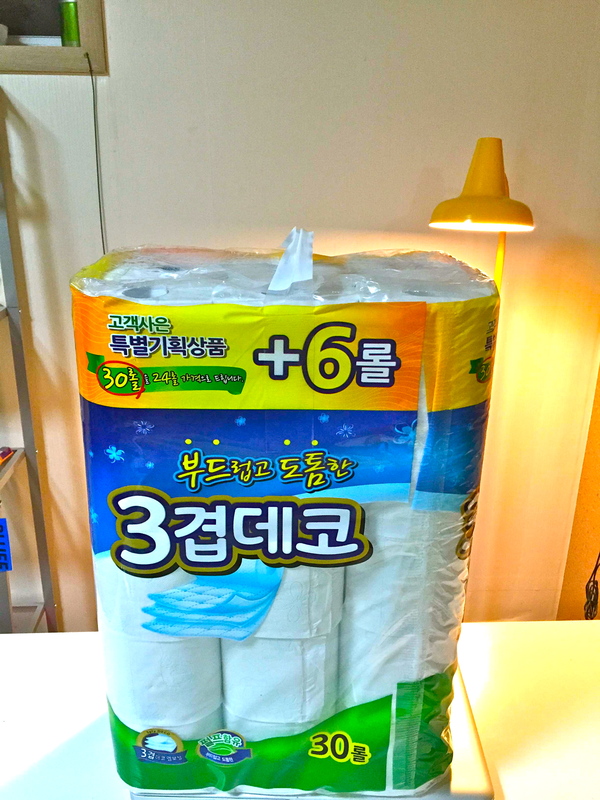 I recently bought a 24 pack with 6 free rolls included for a reasonable 9,000 Korean Won (around £4.50 or $8.00 or Google your local currency). This amount should last at least six months and will avoid hurried trips to the local corner shop spending over the odds for an inferior product at an inflated price. Coffee is delicious. Delicious and essential. Essential and costly. Costly and *sips some coffee* addictive. Many amongst us will be visiting coffee shops either regularly or daily, spending much more than a home made brew would. For the price of a beautiful cup at your favourite place, you could buy a whole 270g bag at your local supermarket. This instant coffee may not have the same flavour or feel that an espresso drink might, but you’ll soon get over that. You’ll come to savour the coffee shop bought one even more, if a little less frequently. This Monday, why not make your own coffee at home and take it with you. Make it special with some home made frozen water (ice), treat yourself to a nice looking plastic cup, boil the kettle and mix with a generous helping of your shop bought dehydrated granules. If you’re not an iced-coffee drinker (why not? ), then, even easier, treat yourself to a nice tumbler and take it with you at all times. Save the nicer establishments for the weekend when you have time to sit in and enjoy your costly coffee. One wonderful way to save money, resources and sanity is by walking or cycling somewhere. If you have to be at a certain place each day, at a certain time, the journey there can become mindless. Why not break the cycle (!) and cycle a bit more. If you can journey the whole distance by bike, great. If not, perfect. Why not go a little by bike or walking? Go not to the nearest bus or subway stop to your home, but the next one or the next one. As far as your commitment to the clock will allow. If the car is genuine necessity, why not park as far from your destination as possible and walk the rest? It will be pleasant, I promise. Tuesday is the day to change your morning routine and travel by a free form of transport. It’s bound to save something on the weekly and monthly costs of getting places and, if nothing else, will prolong the moment you step onto a crowded bus or train and encounter the mostly fresh, but a little sticky, commuter playing Squash the Fruit with your Index Finger 6. The pressure to exercise and be healthy is out there, watching and goading us. Exercising needn’t cost you a sixth (guessing here) of your monthly income. You don’t need a monthly subscription of £45 a month for 24 months to feel good about your body. You know YouTube? The one with the Alan Partridge and Taylor Swift videos? They have thousands (probably) of free exercise classes. And not all of the people making them are obnoxious or intimidating (they need people to keep watching). On Wednesday, have a little look around YouTube for a pilates class, an air boxing workout or a seated aerobics class. It’s all on there and leaving your living quarters is not a requirement. Nor is watching ten others outshine you on a cross-trainer causing you to leave the gym early and eat chips in your car. And may I recommend Blogilates as an accessible intro to working out at home for free. Unless of course you buy one of her T-shirts (which I haven’t). Water consumption and waste is a big problem today. Some people are in desperate need of clean, sanitary water supplies. People living in London, or Seoul, or Lisbon are not. Bottled water can taste nice, yes, but so does water from the tap. It tastes and feels even better if you bottle it yourself and store it in the fridge, and, if you’re usually not someone who drinks from the tap then this is a nice psychological manoeuvre to ease the cessation of the mind. Whilst a 2L bottle of water may not cost all that much in monetary terms, the environmental impact is significantly higher. Why bother with bottled water? Unless it’s sparkling. In which case buy as much as you want. This Thursday is the perfect day to ditch the bottled water and buy yourself two 1.5L Slim Style BPA Free refillable water bottles which you can alternate so as to ensure they are always cold and refreshing. Shopping around all the supermarkets as opposed to being blindly loyal to your favourite, soulless outlet is an excellent way to keep on top of your thrift game. The supermarkets will always have some promotions and special offers on and they are usually pretty similar but tend to alternate periodically. Take my favourite soya milk for example: for two weeks at the leading Korean supermarket it was being sold for half-price. The following week it was to be found at better than half price at a different leading supermarket. Who knows why, but it evidently pays to be aware of this system. I have noticed it will cereals, too (What do you eat for breakfast?). This Friday have a look around or even search online to see what is on offer where. Be sure to stick to things you would normally buy anyway and will be getting at half price otherwise you could quickly find yourself with a cupboard full of things you got just because they were cheap, which is the opposite of saving money. Be wary of BOGOF offers as they are not necessarily a good deal. Find out who is selling the things you always buy anyway but at half price and, as I have done, acquire eight items for the price of four. Time to open a saving account for all the money you have saved! Not really, the banks should be closed today. And who needs savings, really? Saturday is the time to reap the rewards of the thrifty yellow life. Today is day to eat out, go on a trip, visit a friend in another city. Enjoy the money you have, don’t waste it. Use it to assist your lifestyle and not feed the machine. Let the machine feed you. You be the machine and feed yourself and your soul for less.